There are two types of hermit crabs sold as pets: the Ecuadorian crab and the Caribbean crab. The Caribbean crab is also known as the purple claw hermit crab, as well as the purple pincher, land crab or soldier crab. Purple claw crabs are the most popular pet hermit crabs. They can be very unique and interesting pets. Purple claw hermit crabs do best in a glass aquarium, using a minimum of a 10-gallon tank for a few small hermit crabs. As your hermit crabs get larger or as you add more hermit crabs to your group, you'll want to upgrade the size of the aquarium. Keep the aquarium at 75 to 85 degrees with 60 to 70 percent humidity. Use a 50/50 blend of sand and coconut coir; depending on the size of your crabs, you may need a thick layer of substrate because hermit crabs like to burrow. Decorate the enclosure with branches, half logs, driftwood, caves and shells. Purple claw hermit crabs are omnivores. They are not picky eaters and will eat fruits, vegetables, leaves and insects. You can offer a commercial diet as a base, staple diet, but you want to supplement this with fresh fruits and vegetables. Offer different types of foods, such as lettuces, apples, grapes, carrots, oatmeal, crackers, popcorn, dried insects and live insects. Offer a bowl of fresh water at all times; at least once a week, offer salt water. As purple claw hermit crabs grow, they shed their skin (molt). Young hermit crabs molt molt more frequently than adults, which may only molt 12 to 18 months. 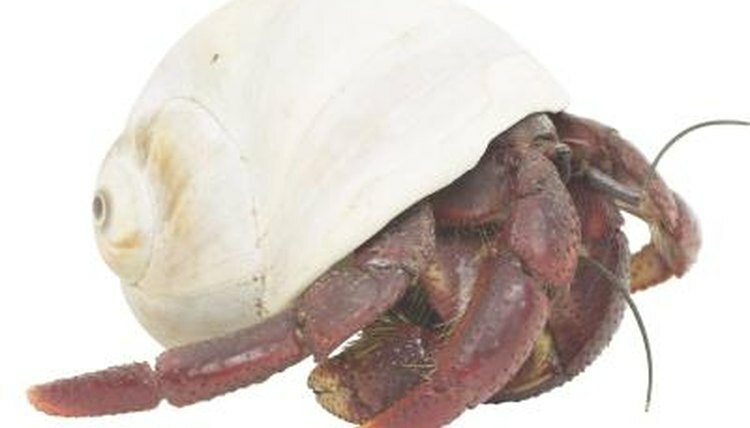 When molting, the hermit crab may burrow underground for a few days or up to eight weeks. When your hermit crab is molting, the exoskeleton will split and your crab will wiggle out of the old exoskeleton. To reduce stress, you want to leave your hermit crab alone during this process; when he's done, leave the old exoskeleton in the tank because your hermit crab will eat it. When keeping purple claw hermit crabs, you want to make sure that you keep different shapes and sizes of shells so that your hermit crab has options when ready to upgrade or a change. Purple claw crabs actually change their shells frequently, especially if they can't find the shell they're looking for, which is why it's important to keep a variety of shells. The more hermit crabs you have, the more shells you want because they will fight over the "prized" shell. Autotomy is when a hermit crab throws off a limb as a defense mechanism. Hermit crab legs have break points at the joints, and if they are grabbed at the leg or claw, it can be broken off to give the crab time to escape. When the leg breaks off, the muscles retract to reduce blood loss. It will take several molts, but eventually, the limb will be restored to its original size, growing a little bit with every molt. What Color Is a Hermit Crab?